1000 gallon stainless steel tank. This is a rectangular tank with (3) opening on top and a sloped bottom. The tank measures 122″ long x 31.25″ wide x 69″ deep. The top has (1) 46″ x 31.25″ opening with a lid, and (2) 31″ x 31.25″ openings, one with a lid and the other is missing its lid. There is a 2″ discharge 10″ from the bottom on an end. The tank sits on a carbon steel frame. Overall dimensions are 126″ long x 35″ wide x 83″ tall. Missing one lid. 1,000 gallon vertical stainless steel tank. This tank has a flat top and bottom. The diameter is 72″, the overall height is 90″, and the straight side height is 60″. The top has a 18″ manway, (1) 4″ sanitary Tri-Clamp inlet, (1) 3″ sanitary Tri-Clamp inlet, (1) 2.5″ sanitary Tri-Clamp inlet, and (2) 2″ sanitary Tri-Clamp inlets. The side has (1) 3″ sanitary Tri-Clamp outlet. The bottom has a 4″ sanitary Tri-Clamp discharge 12″ from the ground. 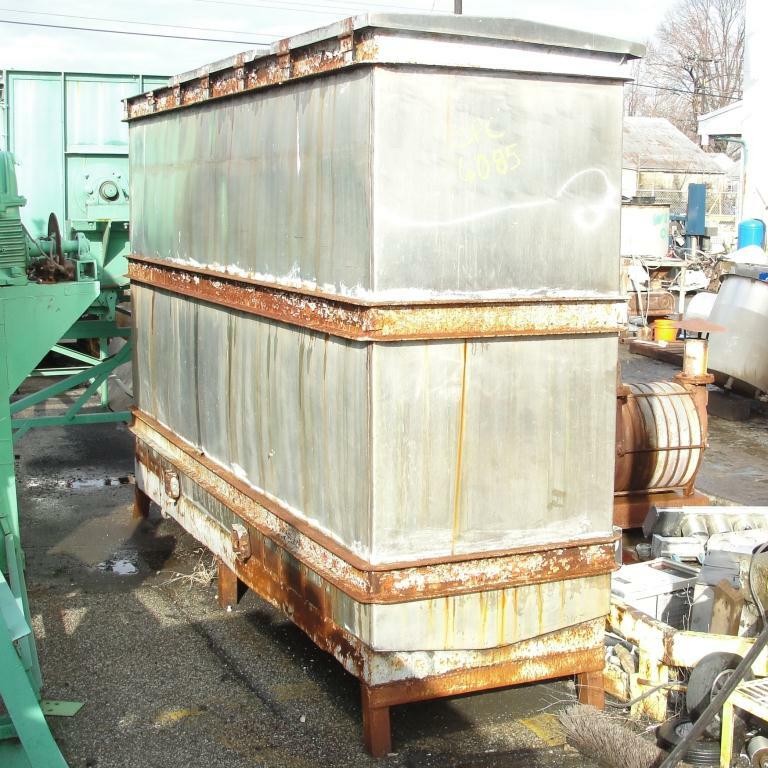 Mueller 1,055 gallon vertical stainless steel tank. This tank has a closed top and an inverted dish bottom. The diameter is 77″, the overall height with agitator is 104″, and the straight side height is 58″. The top has a Lighnin ND-4B 3 hp 1755 rpm agitator, 13″ diameter inlet, and a 23.5″ x 23.5″ manway. The inside has 2.25″ od diameter coils that make 5 passes with the 1″ inlet and 1″ outlet out the top. The side has (1) 1.5″ NPT, (2) 2″ flanges, (3) 4″ flanges, and (1) 2″ NPT outlet 9″ from the ground. Requires 230/460 vac 3 phase electrical supply.